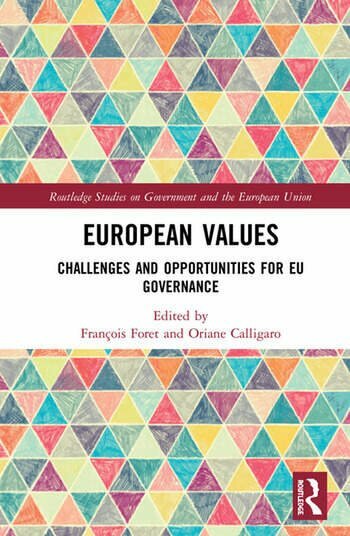 This book discusses the genesis of and increasing references to "European values", their appropriation by diverse groups of actors and their impact on public action. It argues that European values are a broad and flexible symbolic repertoire, instrumental to serving diverging ends, and a resource for both negotiation and conflicts. Looking at the broader picture, the book reflects on the role of values in the institutionalization of the EU as a political order and paves the way to an assessment of its singularity in comparison with other polities across time and space. This text will be of key interest to scholars, students and practitioners in EU politics, comparative politics, IR, public policy, sociology and cultural studies. François Foret is Professor of Political Science, Director of Cevipol and Researcher at the Institute for European Studies at the Université libre de Bruxelles, Belgium. Oriane Calligaro is Research Fellow at Cevipol and at the Institute for European Studies at the Université libre de Bruxelles, Belgium, and Visiting Professor at the College of Europe in Bruges, Belgium.